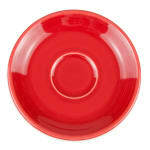 The Homer Laughlin 470326 saucer is finished in a vivid Fiesta® scarlet. This glaze looks great on its own or with coordinating Fiesta colors. This fully vitrified saucer will not absorb odors or flavors and features detailing around the rim of the saucer. The Homer Laughlin 470326 Fiesta saucer measures 57⁄8 inches in diameter. It is safe and durable in the microwave, oven, and dishwasher.